The transient condition can be caused direct connection or through inductive, resistive or capacitive coupling. For instance a lightning strike to electrical equipment is direct, however a strike to earth through pipe-work is a resistive coupling; as is a discharge between clouds giving rise to an inductive coupling. With any 'coupling', it is the effect of the movement of electrons that causes a build up in potential difference within the susceptible equipment. If the build up in potential difference is enough to exceed the rated insulation value of a device, then a malfunction will occur. The final failure in insulation can be minimized by design of a system that will prevent a build up in charge between the insulated conductive paths. This can be achieved through a combination of measures; each of which is essential to ensure an effective transient protection system. Is the potential problem from lightning strike resistive coupling? Inductive coupling? Capacitive coupling? Electrical system load transient? Is the device sized adequately for the type and quality of transient? Is the statistical average impulse in the order of 20kA or 100kA or more? Is there an MEN available adjacent the protection device? Is it necessary the connection cable be less than 100mm? Is the electrical earth of low enough value to mitigate any problem with the selected protective device? Are there electronic switching devices that may cause over-voltage spikes to be impressed onto the protected equipment? What is the anticipated voltage swing due to load fluctuations and is the swing Capacitive or Inductive to cause temporary resonant conditions? 2) Select a surge diverter that provides a balance of risk benefit as to cost benefit. Does the installation require a Surge Reduction Filter (SRF) or is a shunt device adequate? Are the anticipated problems related to low voltage or high voltage devices? How essential is the equipment to be protected? 3) Build an effective protection shield for lightning impulse conditions. What is the incidence of lightning within the geographical area? Is there an effective lightning protection and earthing system installed? Is the system de-coupled from the cathodic protection? Is the lightning protection / electrical system equipotential bond of correct size? Is the earth resistance adequate to ensure protection? Is the lightning protection system of adequate surface area? Is the cathodic protection system earth separated from the instrument system earth? For an installation where there are a combination of earthing systems and high incidence of lightning, there are many difficulties designing and installing effective protection systems. Installation of a shunt surge diverter may be inadequate for the potential problem. If there is a failure of one device and not another, we must ask the question, Why did this particular device fail? We will often find the problem is not related to the installation or absence of the surge diverter but could be related to the earth configuration of the total system. Insulation or component failure between earth and neutral may be due to a fault imported on the equipment to which the device is earthed, not from the power supply side. The earth resistance of the lightning protection system may be too high or of inadequate surface area; the metal may be insulated from earth and an inductive coupled fault will cause components to fail. This type of failure occurs on devices within apparently adequately protected buildings, connected by piping to the ‘outside' world. The coupling is inductive through inter cloud discharge or sheet lightning; or capacitive coupling through insulated systems installed where there is a build up of cloud charge, pre discharge. It is not necessary for a discharge to be to ground. Burnt out motors or other electrical devices may occur when there is a resistive coupling through a ground lightning discharge. The circuit may be through one higher value earth installation, through an MEN or other equipotential bond to neutral, and parallel pathed to the transformer earth. If there is a failure active to neutral or active to earth, there are a number of possible reasons; The tee off cable length to the shunt device is too long. Inductive impedance under fault conditions will cause a let through voltage rise in the order or 1 V / mm (di/dt.) Under these conditions, a device mounted 300mm from the connection point / switch, though rated at < 700Volts, will let through 1000Volts. Enough to cause a failure of a 230 V rated item. This is more of a problem for devices connected to electronic power supplies, as it will result in individual component failure relative to the zero rail. Failure of components at a change of direction of wiring or at the connection point to a motherboard is indicative of a voltage spike or surge caused by high frequency switching devices or high load swings. Such a failure can also be seen following power factor correction system switching transients. Voltage clamps of one kind or another must be installed over insulating joints or instrumentation will fail as touch potential rises. Manufacturers build devices that will provide a degree of protection, generally in line with Australian Standards and IEEE category classifications. 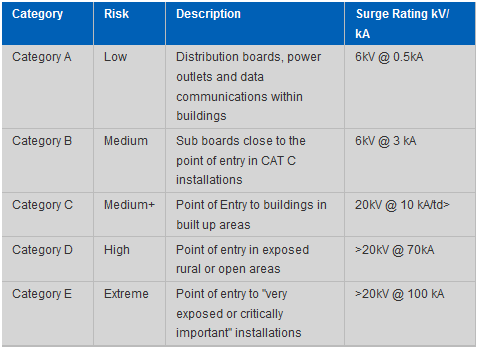 The 5 categories define risk and the protection recommended relative to the exposure of the power supply system. Although effective in most applications, the general nature of the categories does no cater for special applications. Additionally, the IEEE categories are 'recommendations' for protection under the prescribed conditions. There is a requirement to engineer specific applications that fall outside the prescribed conditions, as the IEEE gives no undertaking as to the adequacy of the recommendations outside of the defined scope. By their very design, Metal Oxide Varistor (MOV) surge protection devices deteriorate each time they are subjected to a transient. The higher the risk area, the more they operate and the earlier they fail.